Firebase Industries Ltd. is proud to announce that their sophomore game, Arcadecraft, is now available on the Xbox Live Indie Games Marketplace for the price of 240 MS Points. 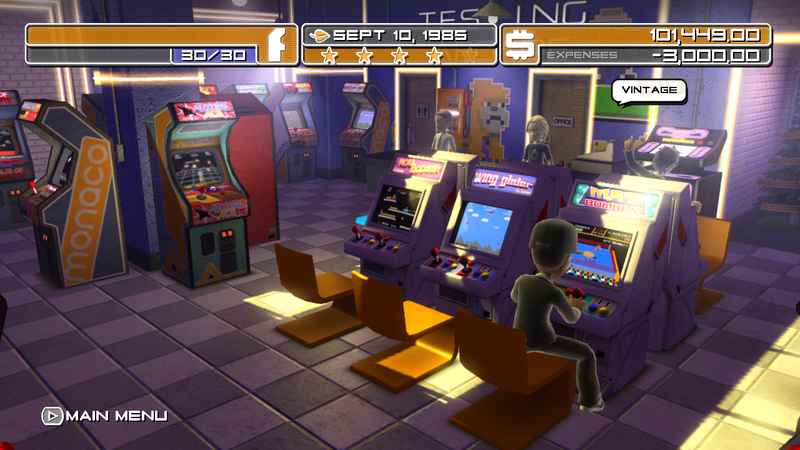 Arcadecraft puts the player in the role of a 1980 video game arcade entrepreneur, when video games were seen as nothing more than a passing fad to be capitalized on. Bank loan in hand, deep in debt, and tied to a lease, the player must use their finances to purchase arcade machines from the multiple manufacturers and then move and rotate them into position within their arcade. Attracting customers with the hottest new games, players start building a fortune one quarter at a time while navigating the financial rollercoaster ride that was the historic fast rise, immediate collapse, and glorious return of the arcade industry over six full years of accelerated time simulation. Players name their space, paint the walls, change the floors, add graphics, and colorful neon to make the arcade their own! They may also decorate and serve with vending machines and novelty items such as Christmas Trees and Halloween Pumpkins. Visitors, from expert game players, salesmen, and game collectors appear in the arcade offering their services while power outages, home versions of games, industry shifts, and more work to get in the way of financial freedom! Players will also see their Xbox Live friends enjoying the games in their arcade but will need to keep a close eye on them less they go on a machine smashing rampage. Owners of Firebase’s previous game, Orbitron: Revolution (80 MS Points) will be able to access an exclusive Orbitron: Revolution arcade machine via a passcode system shared between both games. This entry was posted on Friday, February 1st, 2013 at 6:14 am and is filed under Everyone, National News, New Releases, Simulations. You can follow any responses to this entry through the RSS 2.0 feed. You can leave a response, or trackback from your own site.